The following was written with Prof. Gerold Riempp, a professor of information systems who was diagnosed with Parkinson’s disease 16 years ago at age 36. He is co-founder of a charitable organization in Germany that supports the development of therapies that aim to cure PD. The idea behind cell replacement therapy(CRT) for PD is pretty simple: motor symptoms in PD are primarily a result of dysfunction and death of a specific kind of cell in the midbrain. Since the progressive loss of motor skills is one of the biggest problem most diagnosed face, why not try to replace those cells? Once diagnosed, most people have already lost production of 50-80% of dopamine in their midbrain. The problem then is to stop further disease progression by figuring out how to get rid of everything that might be harming the remaining 20-50% of cells while giving their body everything it needs to keep those cells alive and active. Of those 50-80% of non-dopamine producing cells, a portion are still alive, they are just not doing their job, producing dopamine. This impairment is a result of a range of interrelated factors that harm the cells and eventually lead to their death. Most researchers believe the problem can be boiled down to the clumping of a misfolded protein called alpha-synuclein. Many different methods are being tried in labs around the world to clear these clumps and stop more from accumulating. But this might only be part of the story since a wide variety of other factors also lead to cell death. Then we come to what to do about all of those dead cells. A couple of different options are being considered to get the brain to stimulate the production of new neurons or replace the function of dead ones. However, the most promising therapy being developed is stem cell therapy, now commonly referred to as cell replacement therapy(CRT). It works by placing new dopamine producing neurons into the part of the brain where the dead neurons used to release dopamine. The late 80’s and 90’s saw a number of CRT trials for Parkinson’s disease with mixed results. But we now have a much better understanding of what kind of cells to use, how to culture and store those cells, how to implant them, and who this therapy would be best for. New York City – Run by Dr. Lorenz Studer out of the Rockefeller research labs in New York City. Dr. Studer pioneered many of the reprogramming techniques being used around the world to convert pluripotent stem cells into dopamine producing neurons. His lab was recently announced to be part of a huge funding initiative from Bayer Pharmaceuticals to help speed up development of CRT. Studer’s lab is aiming to start transplantation of embryonic stem cells in human trials in early 2018. Kyoto, Japan – Dr. Jun Takahashi’s lab in Kyoto is working on producing several iPS lines for the Japanese population. One advantage they have is the relative homogeneity of Japanese people allows them to use a dozen or so iPS lines for almost everyone in the country. The lab recently made headlines with results from monkey trials that showed human iPS cells graft safely, with no signs of malignant growth, two years after transplantation. Cambridge, England – Dr. Roger Barker’s lab has been working on cell replacement therapy for Parkinson’s disease for a number of years through the Transeuro project. His lab is pushing forward with more embryonic stem cell transplantations expected to begin in 2020. They also work very closely with the team in Sweden. Lund, Sweden – The lab in Lund has been working on CRT for PD since the 80’s and has been part of a number of human trials. The lab is now run by Dr. Malin Parmar whose team has also pioneered many of the techniques used in direct programming that will one day allow researchers to skip the stem cell phase all together and produce dopamine cells directly in the brain. San Diego, California – The team is moving rapidly towards iPS cell transplantation under Dr. Jeanne Loring at the Scripps research center. They are the only lab that uses patient’s own cells for transplantation. Another unique feature of this lab is that it has been a community funded initiative under the Summit For Stem Cells foundation. Also, producing pure batches of dopamine neurons is still a highly technical process that only a few labs in the world are capable of doing safely and effectively. Thankfully a few other labs around the world are joining the efforts of the GForce-PD, such as Dr. Tilo Kunath’s lab in Edinburgh, which is working on techniques to better differentiate and characterize the cell lines used for transplantation. These therapies being developed for Parkinson’s disease will, in essence, be version 1.0 of CRT. Clinical trials are set to begin next year and the therapy is expected to be widely available to people diagnosed with Parkinson’s disease within the next 5-10 years. CRT for PD is one of the most exciting areas of research on the planet. It is a powerful demonstration of the progress we as a species have made in our attempt to gain mastery over the forces of biology. It has the potential to improve the lives of the millions living with PD, and the millions yet to be diagnosed. Once the transplanted cells have connected with their surroundings and start delivering dopamine to the right places, it should allow patients to gradually reduce their medication. Being able to move normally and not deal with the side effects of all the drugs and other therapies is what PD patients around the world are dreaming of. 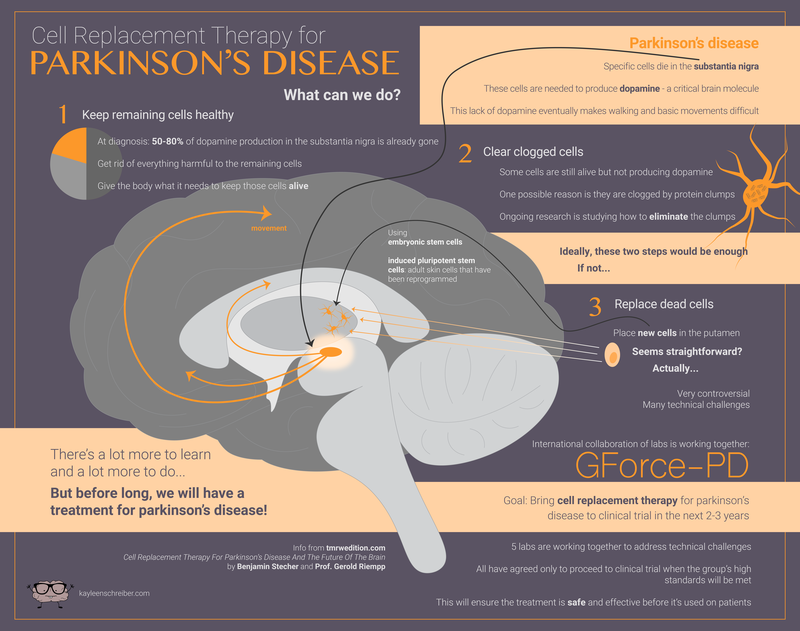 Click here for more information on the future of cell replacement therapy for Parkinson’s disease and the work of the GForce-PD. What about stopping the disease. If disease is not halted no matter how many cells are replaced the disease will eventually attack the newly developed cells. Good point, though presumably steps 1 and 2, if done rigorously, would stop disease progression in most cases. If not then version 2.0 of cell therapy might. hope that the timelines for the treatments in this article prove to be wrong, but in a good way.